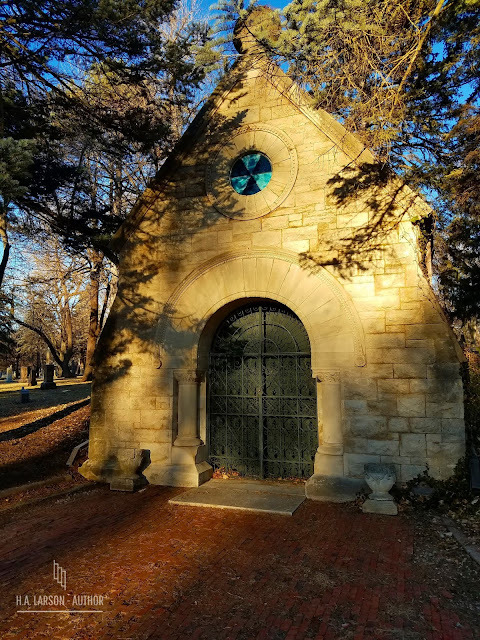 A few weeks ago we took a weekend family getaway to Kansas City. It didn't originally start out to be a family getaway, but rather an overnight on a Sunday to see a concert for my husband and myself. I had to take the Monday off after as there was no way I was going to come into work after attending a concert three hours away the evening before. Since we wouldn't be around to take the kids to school that Monday, I thought, "Why don't we just take the kids with us?" We had booked a hotel with a pool and there's plenty of fun and free things to do in Kansas City, so we figured why not? 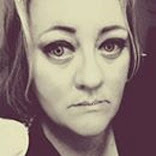 Then, I thought about one of my closet friends, who lives just across the border from Iowa in Missouri, and thought, "Why don't we go down to Audrey's on Saturday, hang out with her, then go to KC from her house Sunday morning?" Luckily, it was her weekend off from work, so our overnight concert trip became a weekend family trip. Audrey lives in a very small town in north-central Missouri and it reminds me of the typical Midwestern rural lands & towns I grew up in. We got settled in at her place before heading over to her sister's house for a barbecue that evening. Her sister lives out in the country, where she owns a nice chunk of land, and she took us for a tour of her land in her truck. 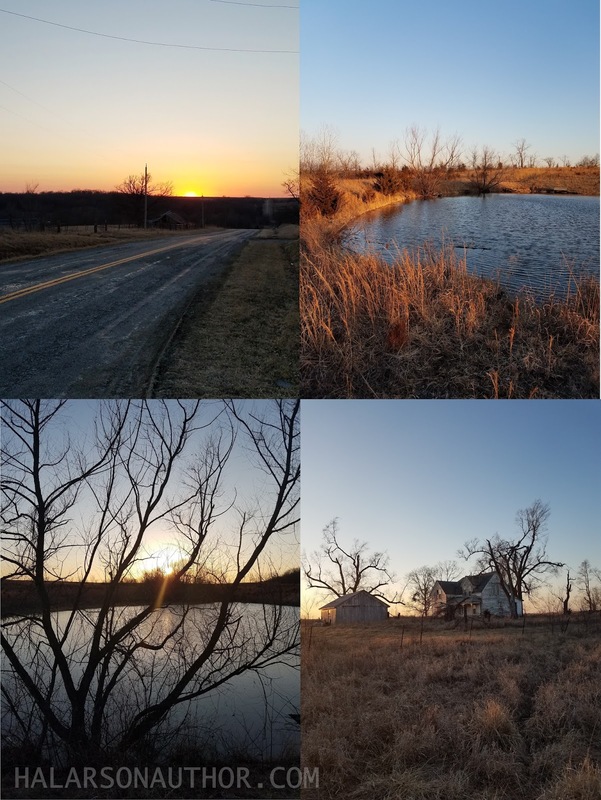 The weather was in the 60s, making for a gorgeous evening in the beautiful and serene countryside. 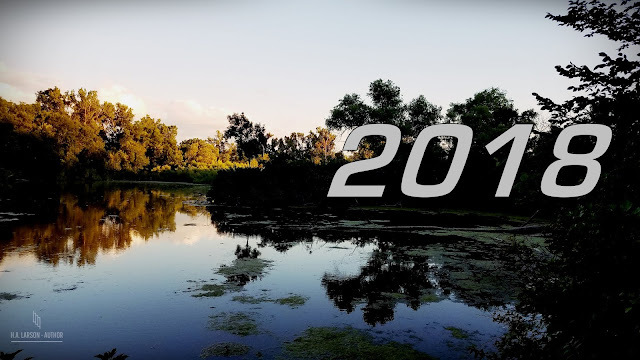 Above photo, going clockwise: a view of the country road and an old barn from Audrey's sister's place; a view of the North pond; an old abandoned farmhouse hidden from view somewhere in Audrey's sister's property; and watching sunset through the trees on the North pond. The next morning, we headed off bright and early for KC. We called the hotel halfway there to see if we could check in early, and they informed us that our room was ready. We were able to check in, then, when we arrived at 10:30. After unpacking and getting ready, we headed off to the Nelson-Atkins Museum of Art. Free to the public, we took the kids for a day of art. Even though I've been there twice before, the kids had never been there and they both loved it. With amazing displays and incredible works of art, this museum rivals some of the best in the world. 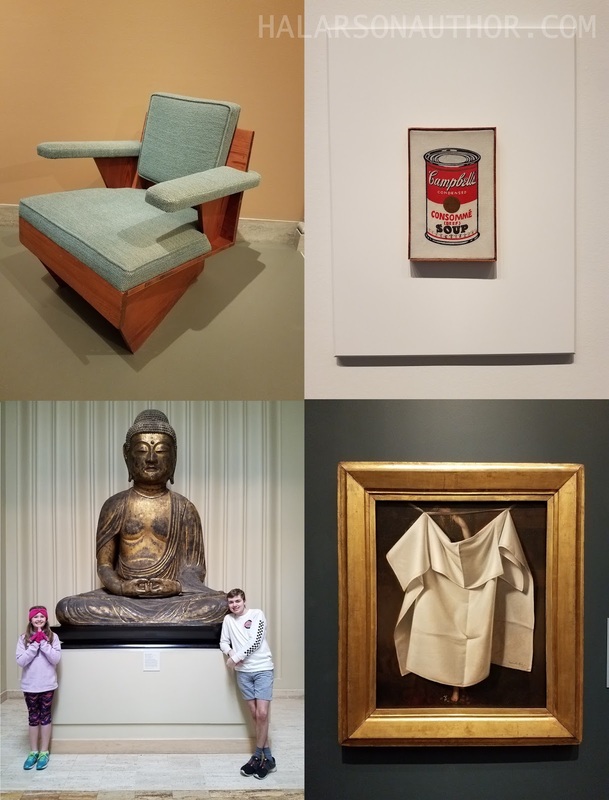 Above photo, going clockwise: a chair designed by Frank Lloyd Wright; one of Andy Warhol's famous soup can paintings; Raphaelle Peale's "Venus Rising from the Sea"; and the kids standing next to the massive Buddha statue in the Asian Art wing. After the museum, we made a pit stop at Betty Rae's Ice Cream shop on the kid's suggestion (of course). They had standard vegan chocolate and vanilla flavors so I was down. After relaxing at the hotel for a bit, we left the kids (don't worry, the teen is 18) to swim and watch movies while we headed down to The Riot Room to meet my friend Betty and her husband. 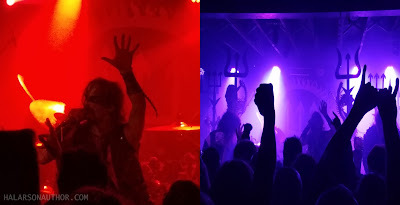 We were there to see legendary black metallers Watain and Destroyer 666. You all know I'm a metalhead, and seeing this concert was one for the record books. While the venue itself was set up in the worst way possible, the show was excellent. Watain puts on a great live show and I really enjoyed myself. It was nice to catch up with Betty as well. You'll remember her from our ghost hunt of Edinburgh manor. The next morning, our last day in KC, we checked out of the hotel and headed down to the Power & Light District. They have a streetcar (which is like a mini bullet train that reminds me exactly of Dublin's Luas) that you can ride for free, so we hopped on board. It runs a loop from the River Market to Union Station and back. Our first stop was the main branch of the Kansas City Public Library. Housed in an old First National Bank, this massive library takes up five floors and contains exhibits within its impressive architecture. One of our favorite things was the old safe in the basement that is now a theatre. Very cool. 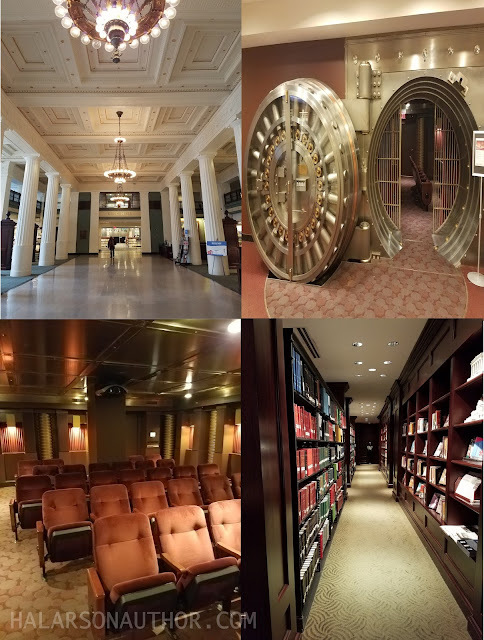 Above photo, going clockwise: the entrance hall; the doors of the old safe; the opulent reading room on the top floor; and a view of the inside of the safe-theatre. After visiting the library, we hopped back on the streetcar and rode down to Union Station. It's an old train station that reminds me of Omaha's Durham Museum - itself once an old train station - but it's much larger. Escaping demolition, it was remodeled and repurposed into the multi-use venue it is today. This impressive structure is now home to Science City, restaurants, and other neat places. It was interesting just to look around inside, and at the end of the Grand Hall, there was a model train exhibit - which was HUGE and free! 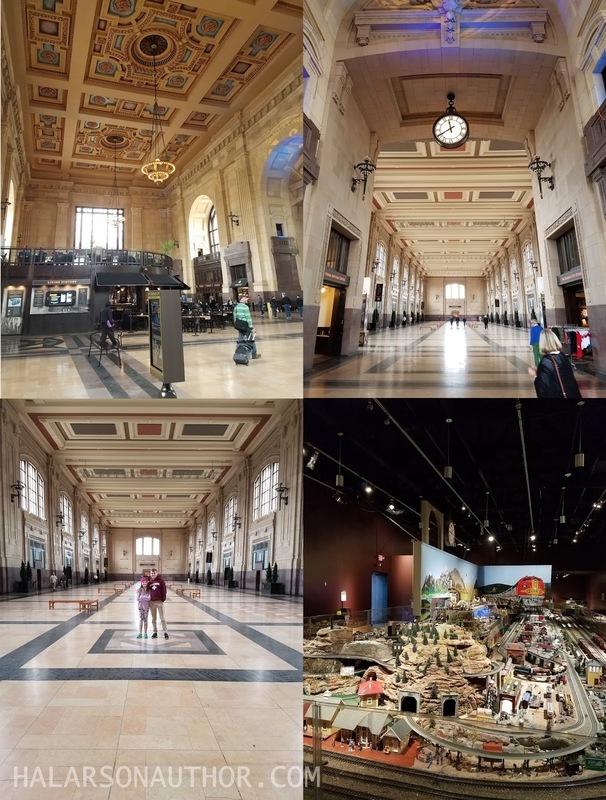 Above photo, going clockwise: A view of Union Station as we entered; an impressive view of the Grand Hall; the largest display in the model train exhibit; and the kids standing in the Great Hall. Kansas City is one of our frequent haunts. Only 2.5 to 3 hours by car, it's an easy place to get away to for a weekend. We've gone down for everything from the Renaissance Faire, visits with friends, concerts, and, of course, our Anniversary Trip. Our little, basically impromptu, family trip to Kansas City ended up being fun and energizing. It was nice for the four of us to get away, and get away together. Have you picked up any of my books lately? If not, check out my Amazon Author Page and grab a copy of one today!